BRITAIN has proved it is still a major global player after successfully leading a key Nato task group for the past year, defence secretary Gavin Williamson has said. The Tory bigwig spoke as HMS Duncan returned to her home port of Portsmouth after a six-month stint leading the military alliance’s Standing Maritime Group 2. Mr Williamson’s comments come as US president Donald Trump spent his second day in the UK after previously lashing out at Nato allies – including Britain – for not spending enough on defence. However, the defence secretary said Britain was committed to its role helping to police the globe and to playing its part in the military collective. He said: ‘HMS Duncan and her crew have demonstrated why the Royal Navy is revered all over the world for its leadership, professionalism and skill. ‘In taking charge of Nato’s standing Maritime Group 2 for the second time in a year, Britain and the Royal Navy embody what we mean by “global Britain”. Nato is a vital part of Britain’s defence. The alliance, and its guarantee of collective security under Article 5, creates a protective shield for the UK and its allies. Britain is one of the few countries in Nato meeting the baseline two per cent GDP spending on defence. However, critics – including MPs – want to see this figure bumped up closer to three per cent, citing the growing threat of Russia as a key catalyst for this. 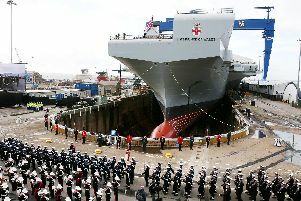 Earlier this month MPs siting on the influential defence committee said that if Whitehall was to increase spending by half a per cent, it could raises billions more for the armed forces and fill ‘black holes’ in the military’s budgets.